You’ll find the Windsor Castle nestled in the back streets of Windsor, minutes from the train station and a short stroll from Chapel Street. The pub is a south side icon with its striking lime façade and pink elephants. It’s a popular destination for locals with its cozy fireplace, great pub food and beer garden. The tropical outdoor space is a popular sunny day destination. 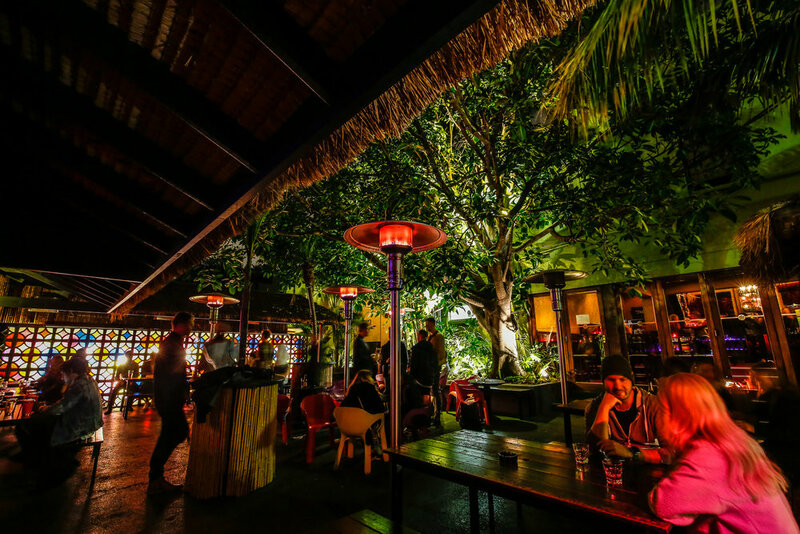 It features a bamboo clad bar, ample seating and lush surrounding. We have DJs spinning tunes Friday and Saturday and weekly trivia every Tuesday with Off the Wall Quiz hosted by Cooper from 7pm. We are open 7 days and closed most holidays. Note: We will be closing for trade on Good Friday and Easter Monday. For the last decade we've poured & supported a range of local, Australian and international wineries and brewers. We have Furphy, Little Creatures IPA, Little Creatures Bright Ale, James Squire 150 Lashes, 5 Seeds Apple Cider and a special guest beer on tap. We also carry a range of local and international bottled beers. Open Table bookings are for the restaurant only. You are welcome to dine in the bar, no reservation needed. Cos lettuce, candied bacon, free range crumbed and fried egg, croutons, parmesan, and classic caesar dressing.